A restaurant that completely validates my view on food and wine pairing. If you know me well, you know that I will pretty much drink the bubbly with anything. But that doesn't mean it goes with everything (though in my mind it does unless I'm eating a big juicy steak or something). Many might argue that it also does not go with fried chicken. Well, sorry to break it you you but you're wrong (or agree to disagree). The bubbles and acidity provide a perfect way to cut through the fattiness of the chicken. I think the dry citrus flavors of the sparkling wine make an awesome pairing with the salty, peppery fried chicken. Chef Sarah Simmons, you are speaking to my soul with the creation of "Birds and Bubbles" restaurant on Forsythe Street in NYC. And for that, I thank you. I had a rare Saturday night off in September, so my friends Hannah and Dana decided it was the perfect excuse for a girls' night in the city. I decided on Birds and Bubbles for the obvious reasons mentioned above but also because I have a new strategy during my nights out in New York. Because I don't live there, I tend to get a little overwhelmed by the plethora of dining options. Ask 10 different New Yorkers for their five favorite restaurants and you'll get 10 different answers. So lately, I've been concentrating on the new, up and coming places. Much more manageable! 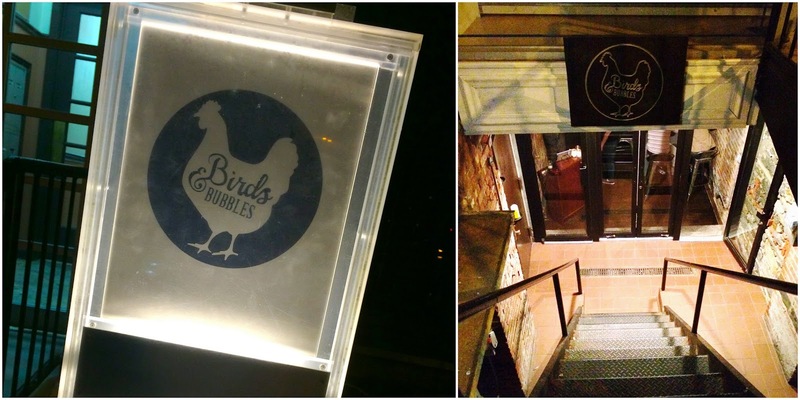 Birds and Bubbles is located just north of Chinatown on LES. You might miss it if you weren't looking for it. The restaurant is located down a steep little flight of stairs. The inside is warm and cozy but also beautifully decorated. I love the long comfy booth that runs along the wall. There's also a garden patio for when it's nice outside. Onto the food. Simmons was recently named one of the top 50 chefs in New York City by Food and Wine magazine and I can see why. Since there were three of us, we decided on "Winner Winner Chicken Dinner." 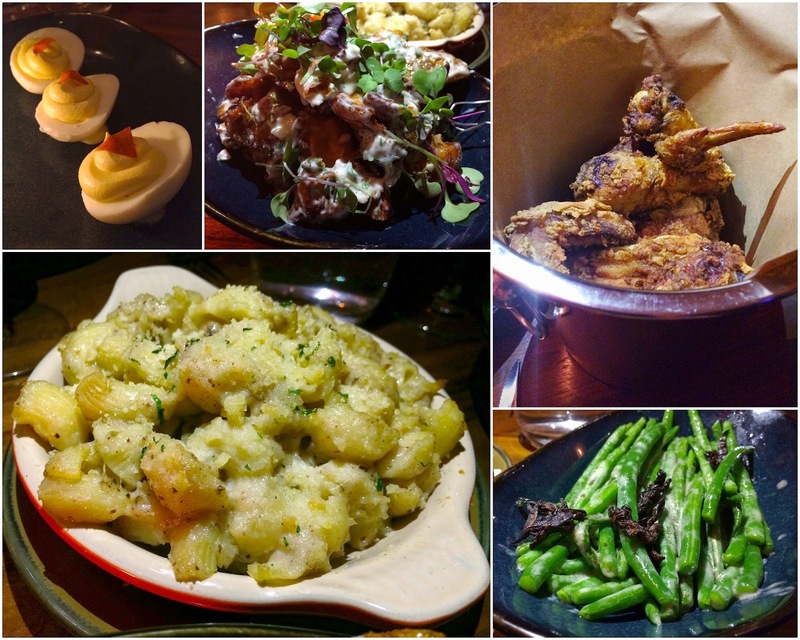 For $65, you get a whole fried chicken (served in champagne buckets), along with three sides and a bread basket containing three different types of baked delights. Buttermilk biscuits, jalapeño corn bread and benne seed brioche rolls. It was more than enough food, and at just over $20 per person, this is a steal in New York! I'd venture to say 4 girls could potentially split this and be perfectly content without leaving uncomfortably full. They have a wide variety of bottles to choose from, along with mixed drinks if bubbles aren't your thing (though just know we probably can't be friends). We actually went with a Spanish cava over champagne to keep the cost down a bit, and it was still very good (and still went great with our meal). We also ordered the devil eggs to start (top left), which were cleverly filed under the section of the menu entitled: "Which Came First." (I laughed). Those little triangles on top? Those are Sriracha flakes. Yes, flakes. Made out of sriracha. Genius. For our three sides, we ordered the crispy potato salad (top, middle), Sophie's Mac and Cheese (bottom, left) and green bean casserole (bottom, right). The potato salad stole the sides show, served warm and tossed with shallot aioli, capers and micro greens. Kudos to our waiter for suggesting it. (The photo really doesn't do it justice). It was crispy and warm and perfect. The Mac and cheese was pretty standard, the green beans were less casserole and more straight green beans but still delicious (and nice to get some green veggies on the table). As for the actual buttermilk fried chicken, it was very good. The chef, Sarah Simmons, is originally from North Carolina so her southern roots really come through here. I think the best part about it was how she manages to keep the chicken moist and juicy while achieving a crispy coating. My friend Hannah lived in the South for several years, and it received her stamp of approval as well. Best of all... it paired perfectly with our bottle of bubbly! Birds and bubbles? I'll drink to that! Had a great experience at Boston restaurants. There was a good amount of people and the atmosphere was lively. Throughout the night, the bartenders were very friendly and attentive. Couldn't be happier with their service. Recommend this place without hesitation. I would LOVE to hear what you think. I read every comment and get a little giddy when I see someone has left one on the blog. Thanks for stopping by! I'm an emmy-award winning sports reporter and anchor, but now I'm focusing on my other passions: food and traveling! You've probably seen me in the past on various Food Network shows or anchoring Sports Center on ESPN. I'm a Montana girl at heart, but school and career have taken me to Washington, Spain, California, Connecticut and now New York. Constantly planning my next meal, I'm always whipping up creations in the kitchen or sampling new restaurants. I will eat just about everything except bell peppers, for which I hold an irrational hatred. I can rarely say no to fancy cheese and a glass of bubbles, but my last meal on earth would be a carne asada burrito from pretty much any taco shop in San Diego. All images and content are copywrited by Jaymee Sire, the owner of "eisforeat.com", unless otherwise noted. If you use any of my images, please credit eisforeat.com.